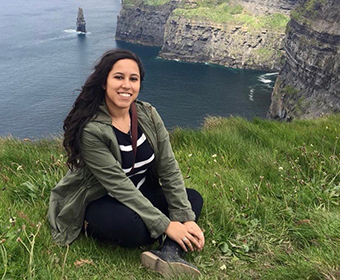 UTSA human resource management senior Elizabet Mata studied in Ireland in 2018. (Feb. 1, 2019) -- Studying abroad provides UTSA students experiential learning opportunities that have a lasting impact. Roadrunners can learn more about how studying abroad will help develop their skills at the bi-annual UTSA Study Abroad Fair. Education Abroad will host the Study Abroad Fair from 10 a.m. to 2 p.m. on Tuesday, Feb. 5 at Sombrilla Plaza on the UTSA Main Campus. At the fair, students have direct access to UTSA faculty who lead trips as well as partner providers to answer questions and provide additional information. Studying abroad allows for the development of intra-personal, cognitive and interpersonal skills for the workplace. Students also learn how to be adaptable and flexible while gaining intercultural skills. Research has shown that students who study abroad have a higher graduation rate and UTSA’s participation in study abroad has grown by nearly 50 percent throughout the last five years. After the fair, students can attend one of the weekly First Steps meetings, where Education Abroad staff help students pick their program and walk them through the application process. Learn more about UTSA Education Abroad.